For the past three years, the state has been carrying out a policy of closing sheltered workshops for people with developmental disabilities and subsequently placing those people in mainstream workforce jobs. Yet the Legislature, which bought into this policy, is failing to provide the necessary funding for it. As the Department of Developmental Services and its corporate service providers jointly proclaimed in 2013, the policy has been to move developmentally disabled people out of sheltered workshops and into community-based day programs and ultimately to the mainstream workforce. Sheltered workshops are settings in which developmentally disabled people work together on simple assembly-line tasks and are usually paid a small wage. The workshops have gone out of favor because they are viewed as “segregating” their participants from their non-disabled peers in the community. Since 2013, the majority of the remaining sheltered workshops in Massachusetts have reportedly been closed. All are scheduled to be closed as of June 30 of this year. But the problem is that the Legislature, and to some extent the administration itself, aren’t following through on the policy, which calls for beefing up funding for DDS day programs and job development staffing. Last week, the Senate joined the House in rejecting higher funding levels considered by the policy planners to be needed by both day programs and employment programs for Fiscal Year 2017. The irony is that the Democratic-run House and Senate have proposed even less funding for these line items for Fiscal ’17 than Republican Governor Baker has. A likely result of this apparent under-funding is that relatively few people will be placed in mainstream jobs, but rather will be sent to potentially overcrowded day programs with inadequate staffing. In order to accomplish the policy for “integrated employment” of the developmentally disabled, the Legislature initially increased funding of the community-based day program line item in the state budget, and created a new line item to fund the transfers from the sheltered workshops. The idea was to increase both day program and job development staffing and training. The new sheltered workshop transfer budget line item (5920-2026) was initially funded in Fiscal ’15 with $1 million. That amount was raised to $3 million in the current fiscal year, and the governor proposed to boost it to $7.6 million in Fiscal ’17. But the House and now the Senate are not going with the governor’s plan. As the House did last month, the Senate last week approved a budget plan for Fiscal ’17 that will eliminate Governor Baker’s proposed $4.6 funding increase for the sheltered workshop transfer line item. Amendments proposed in both the House and Senate to restore the governor’s increase for the line item were rejected by the House and Senate leadership. As a result, the account will be level-funded next year, which amounts to a cut when adjusted for inflation. Yet, even the governor’s proposed $4.6 million increase in this line item was $1 million too low, according to the Massachusetts Association of Developmental Disabilities Providers (ADDP). The ADDP lobbies on behalf of corporate DDS providers, which operate day and work programs throughout the state. In addition, the Senate budget approved last week would provide $700,000 less in spending for the community day and work line item (5920-2025) than the amount the House and the governor proposed. The governor and the House proposed a 4.9 percent increase in that account for Fiscal ’17. In an email sent to members in early May, the ADDP contended that even the 4.9 percent increase in the day and work line item was $9.8 million less than the what was needed to maintain existing services. As a result, according to the ADDP, DDS was already planning to cut 5 percent in funding for contracts with all day and employment providers. Should the Senate’s budget plan prevail regarding the day and work line item, it would seem the cut in contract funding for day and employment providers would have to be even deeper than 5 percent. Both the ADDP and the Arc of Massachusetts have become virtual partners with DDS in the operation of the department. The Arc and the ADDP co-authored a report with DDS in 2013 that called for the closures of the sheltered workshops as of June 2015. While that goal wasn’t met, DDS is continuing to work for those closures as of this June of this year. In comments submitted to EOHHS Secretary Marylou Sudders late last year, the ADDP maintained that funding for both the community day and work line item and sheltered workshops transfer line items needed to be boosted significantly in order to fulfill the plans to close the workshops and transfer clients to mainstream jobs. A failure to boost that funding could put the state in violation of requirements issued by the federal Centers for Medicare and Medicaid Services (CMS), according to the ADDP. The ADDP comments also noted that as of October 2015, the number of individuals receiving community based day services more than doubled from 2,656 individuals as of June 2013, to 5,422. While noting that this increase was directly related to the closures of the sheltered workshops, the ADDP stated that the majority of those persons were not receiving any other DDS-funded employment services. The ADDP comments also pointed out that DDS day programs require significantly higher levels of staffing than the sheltered workshops did. As we pointed out in a blog post in January, DDS records show that the number of participants in sheltered workshops dropped by 61 percent between August 2014 and August 2015, and the number of persons in corporate-run community-based day programs increased by 27 percent. Yet, the number of developmentally disabled people in “integrated employment” settings rose during that same period by only about 6 percent. It appears that the only policy the Legislature and the administration have pursued with a real level of commitment has been closing the sheltered workshops. But that’s only half the plan. The problem with the Legislature, in particular, is that while it bought into the first half of the plan, it now has seemingly abandoned the critically important second half. Thousands of people have or will be removed from their sheltered workshops, and the Legislature appears to be leaving an unknown number of them in the lurch. If you do some intensive searching, you may just find a series of what seem to be fairly well-hidden reports on the Department of Developmental Services website that present data on deaths in the DDS system between the years 2001 and 2013. We did find those reports, and reviewed them going back to 2008, the year the then Patrick administration implemented its “Community First” initiative. Within DDS, the initiative involved a major push to close large state-run developmental centers and to move the residents of those facilities to community-based group homes. It appears to be difficult from the data in the reports to draw any firm conclusions about the total numbers of deaths in the DDS system, which have fluctuated substantially in years between 2008 and 2013. There was a low of 406 deaths in 2010 and a high of 438 deaths in 2012. 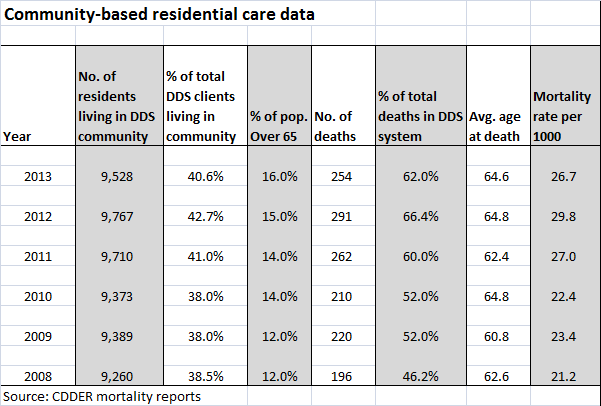 What did appear to stand out in the data was the significantly higher number of deaths in the community residential system in 2013 than in 2008. There were 196 deaths in the community residential category in 2008, and that number rose to 254 deaths in that category in 2013. That was an increase of 58 deaths per year, or about 30 percent. The number of deaths in the community system rose in three of the five years between 2008 and 2013. There was a slight drop in the number of deaths in the community system in 2010, and a somewhat larger drop in 2013, the latest year for which the mortality reports are available. Nevertheless, the increase in the number of annual deaths between 2008 and 2013 is statistically significant. In contrast to the community residential system, the numbers of deaths in the developmental centers and living-at-home categories decreased fairly steadily between 2008 and 2013. The percentages of all deaths in the DDS system rose in the community residential category from 46.2 percent in 2008 to 62 percent in 2013, while the percentages of all deaths dropped in that time in the developmental centers and among people living at home. During that time, the percentage of DDS clients living in the community system increased only slightly — by 2.1 percent. The data raises some questions. Did the closures of the Fernald, Monson, and Glavin developmental centers, starting in 2008, contribute to the increase in the overall death rate in the community system? Were there people living in those centers who died as a result of having been moved into the community system? The mortality reports, which were done by the Center for Developmental Disabilities Evaluation and Research (CDDER) within UMass Medical School, do not offer any speculation or answers to that question. CDDER’s 2010-2011 mortality report does offer some speculation about a statistically significant increase in deaths in the community system between those two years. The report states that the increase may have been due to people with “high medical needs” having been moved into the community at that time from nursing homes. But we found no discussion in any of the reports about the potential impact of moving people into the community from the developmental centers. The CDDER reports also do not appear to differentiate between corporate-provider-run and commonwealth-operated group homes. The community residential category examined in the reports appears to lump both of those types of residential care together. This allows no comparisons to be made between the state-run and privatized group home systems with regard to the mortality rate. There is a lot of important research contained in the CDDER reports, but the omissions are concerning, though perhaps not surprising. CDDER is under contract to DDS to produce the reports, and they are not going to produce or analyze any data that DDS doesn’t want them to produce or analyze. For years, we have been critical of the ongoing privatization of DDS services. We have raised concerns about the Patrick and now Baker administrations’ policies of under-funding state-operated care, closing existing state-operated group homes, and preventing people from choosing state-operated care as a residential option. We have also expressed concern that care in the privatized system is not as well overseen as it should be; that staff in provider-run group homes is often underpaid and inadequately trained, and that provider executives are continuing to make huge salaries nonetheless. We have also been critical of the closures of the developmental centers, which took place in many cases over the objections of the families of the residents in them. One would think the DDS-sponsored mortality reports would examine the impact of both the developmental center closures and privatization of services on client deaths among other variables. That is, unless DDS would rather not get into those matters. Based on the reports, it would seem that DDS does not want CDDER looking into the impact of increasing privatization, at least on client deaths. As a result, we can only glean some hints from the CDDER data about those issues. According to the reports, the community residential system appears to have grown by about 2.9 percent during 2008-2013 period, which makes sense since people were being moved there from nursing homes and from developmental centers. The data show that the number of residents of the developmental centers dropped from 925 in 2008 to 550 in 2013 — a 44 percent decrease. Given that the number of residents in the centers was dropping so rapidly, the number of deaths among that population was bound to drop as well. There were 49 deaths in the centers in 2008, and 24 deaths in 2013 — a 55 percent decrease. Among people living at home, the number of deaths also dropped between 2008 and 2013. There were 69 deaths among people living at home in 2013 — a drop of 18.8 percent from the 85 deaths listed in 2008. The total number of people living at home dropped only by 4.3 percent during that period. Nursing homes and developmental centers had the highest mortality rates per 1,000 clients among the residential settings, according to the 2012-2013 CDDER report. The report explained that the high mortality numbers in those two settings were due to the relatively advanced age of the residents and their relatively serious health conditions. As noted, however, the mortality reports don’t appear to have compared medical data among residents living in the various settings. The data do show that an average of more than 30 percent of the residents of the developmental centers were over the age of 65 between 2008 and 2013, compared with about 14 percent of residents in the community and 5 percent of DDS clients living at home. As of 2013, 550 or 2.3 percent of all DDS adult clients were still living the developmental centers. That year, there were 9,528 clients living in the community system, or 40.6 percent of all DDS clients; and there were 11,822 clients living at home, or 50.4 percent of all DDS clients. In sum, there doesn’t seem to be too much that is surprising in the data, other than the apparent increase in deaths in the community system between 2008 and 2013. We think it’s possible that those transfers from the developmental centers may have contributed to that increase in deaths in the community system. But given that CDDER does not appear to have collected data concerning deaths of former developmental center residents, we may never know the real impact on mortality of the closures of the centers. And unless CDDER begins differentiating between provider-run and state-operated group homes, we may never know the impact of increasing privatization on mortality rates in residential care.